Have you ever had the desire to be free of the power grid and supply your own source of energy to power your home? It's very possible to do now and the costs for setting up your own system have been going down with the availability of cheaper parts and being able to do it yourself with all the information that is now available. You can use solar power which is the more popular way to go. Wind power is good but you need to have room to set up a wind turbine and live in an area that has plenty of wind. The only problem you can encounter with solar would be a lot of cloudy days that may prevent good solar collection, but with back up batteries you could save some power for later use. If you have a cabin or vacation spot you go to, you could set it up with a solar power system to power your lights and appliances. If you do not want to go all out you could set up a back up solar system to keep you going if the power went out. Even installing a solar water heater would be a step toward getting free from the grid. What you could do is buy a complete solar power setup and have a crew install it for you. Shop around for prices to find the best deal. If you can talk to someone that has already set their house up with solar or wind power you could learn from their experiences and save yourself some time researching. Check to see if there are government rebates or tax credits you could take for buying a solar power system. If you are handy with tools and reading plans you could build your own system. Check eBay for deals on panels or check around your town for surplus or used parts dealers. You might find you already have some of the material you need laying around your home. For battery backup get some rechargeable batteries such as used for golf carts. These will need to be vented because of the fumes they put off so plan for that. 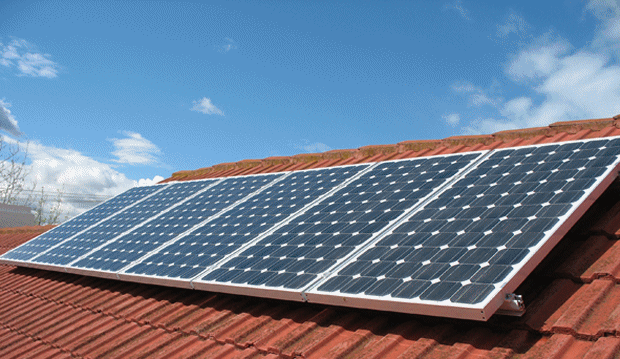 Providing power to a small number of appliances with solar electric power is fairly inexpensive. A basic 3-4 panel system only costs $10,000 and will power all the tools you want for up to 6-8 hours a day. A service change will cost you the same thing. The difference? You don't get a 30% federal tax incentive for an upgrade, and there are no rebates for a standard upgrade. Oh yeah. You also get the electricity for free after the product is installed. Electricity from all photovoltaic systems is in the form of DC(direct current) the same as your car. The convenience of this is that this DC electricity can be stored very easily in batteries. These batteries basically are souped up car batteries and have a maximum amount they can hold. This is actually where most of you cost for this system is because the batteries are about $300-500 a piece and you need at least 2 of them to store the power you are looking for in a serious workshop. In the end, you should be able to run everything in the workshop with a system like this. How Do I use the Stored Power? The nice thing about this system is you can use the stored power while the solar system is recharging the batteries so it is fairly efficient. You simply turn on the DC to AC converter and turn on the power. You have to have a converter with a switch in order for this system to operate correctly. When installed correctly, these systems can perform better than than power from the grid. The only real draw back of this type of system and every solar energy storage system is the batteries just don't last. They last about 3-10 years, almost exactly like a car battery. Also like a car battery, if the connections are free of corrosions, they are not exposed to major temperature changes and stay out of extremely moist conditions, they can last a long time. Just don't expect them to last more than 5 years and you won't be disappointed. Talk to a solar contractor to see what your solar options are.